Valentine’s Day reminds us to tell the people we care about that we love them. Show your customers some love with a contest or giveaway. The entries you collect in February can be added to your lists that you’ll use in the months to come. Jewelry is a popular gift for Valentine’s Day. 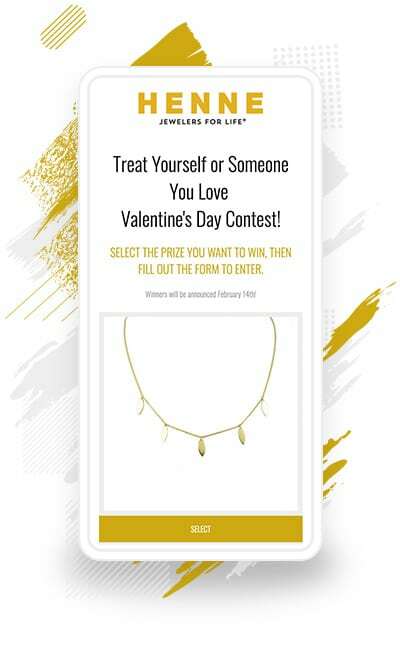 In their Valentine’s Day campaign, Henne Jewelers gives fans a chance to win one of three jewelry prizes. Participants are encouraged to enter to win the prize for themselves or for a loved one. Plus, folks can share the campaign via ShortStack’s refer-a-friend option, which allows people to gain extra entries if someone submits an entry after clicking the referrer’s referral URL. TIP: After form submission, send a ShortStack autoresponder that includes the entrant’s referral URL. Including the referral URL in an autoresponder allows participants to easily share it. Who doesn’t think about candy hearts on Valentine’s Day? 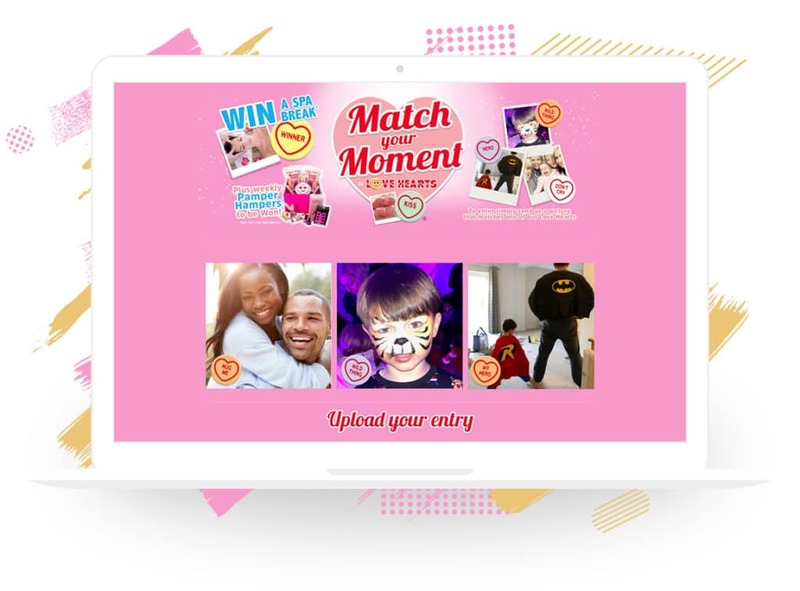 With their “Match your Moment” campaign, Swizzels Matlow Limited asks entrants to submit a photo and match that photo to a love heart saying. Entering qualifies people for a weekly giveaway, plus a grand prize of a spa day. A fun campaign like this is sure to stir up a lot of entries and views, aka leads and engagement. Personality quizzes boost engagement with your brand, something I’m sure Festival Mall has received lots of with their “What Type of Romantic Are You?” quiz. Quiz takers are asked questions such as what gift they would choose or what type of flower bouquet they enjoy. People must fill out a form to find out their romantic personality based on their answers. What a fun way to collect leads! 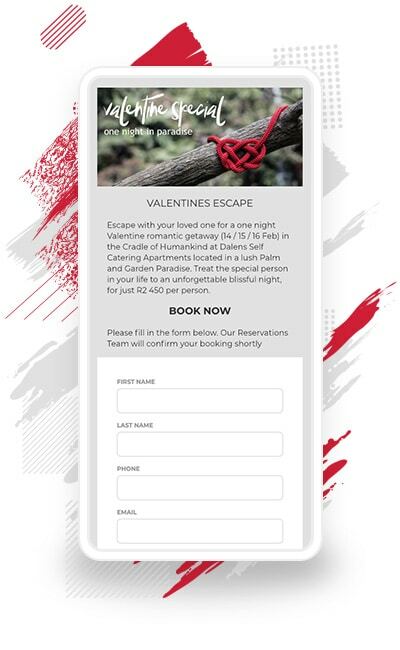 Is your business featuring a Valentine’s Day special? Let your customers know about it! 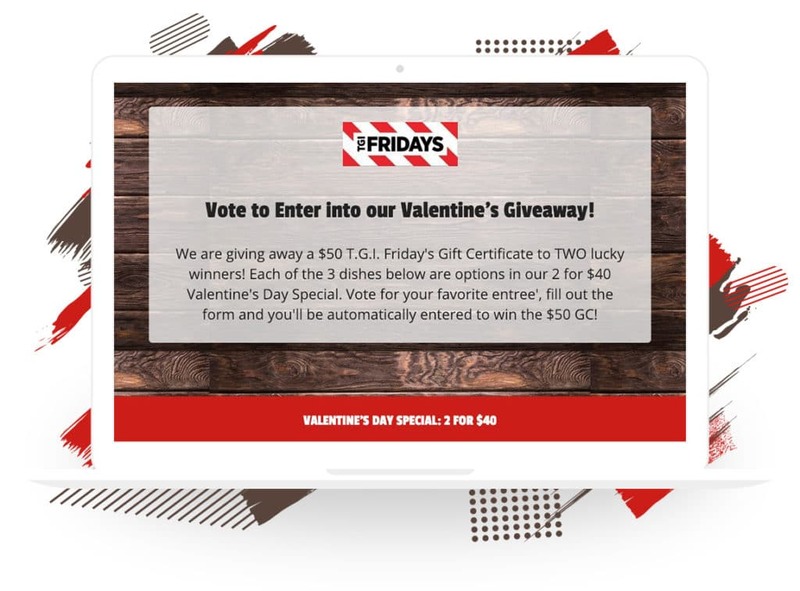 T. G. I. Fridays Guam created a fun campaign to promote their 2 for $40 Valentine’s Day Special. To enter, people must first vote on their favorite of the three featured main dishes. After voting, folks can submit an entry to be eligible to win a $50 gift card. IDEA: Send entrants a scheduled email with the specials you are offering a couple of days before Valentine’s Day. A quick getaway with your significant other is the ultimate Valentine’s Day gift. The opportunity to unplug and indulge, even if it is only for one night, is a luxury in our busy everyday lives. Dalens Luxury Self Catering Apartments created a Valentine’s Day offering for couples. Couples can submit a request to reserve one of three nights via an online form. After submitting a request, a member of the Dalens team confirms the reservation. A reservation form is a smart way for Dalens to collect leads for future remarketing purposes. After you run your campaign, be sure to leverage those leads you collected. ShortStack provides email marketing features, including autoresponders, scheduled emails and follow-up emails. Looking for more Valentine’s Day ideas? Our blog is packed full of them. Check it out!